Zach Eflin has become the slump buster for the Phillies. 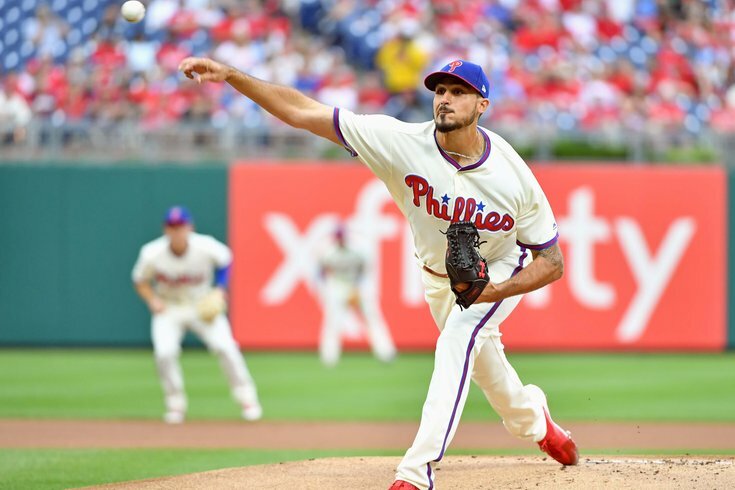 Zach Eflin’s eyes made a quick survey of the Phillies’ clubhouse on Sunday afternoon, after another masterful performance by the 24-year-old right-hander in the Phils’ 4-3 victory over the National League Central Division-leading Milwaukee Brewers. The Phillies were in the throes of a four-game losing streak, compounded by getting blown out twice by the Brewers by a combined 24-7 in the first two games of the weekend homestand. The Phillies had to make an early statement, and though it’s just June, they had to reply on Sunday. “Coming off the games in Chicago and the two games before [against Milwaukee], you know that really set an little mood in the clubhouse to want go out and beat [the Brewers],” said Eflin, who drove his record to 3-2 with a nine-strikeout, three-hit performance, after winning the lone game in Chicago last week. “Being able to do that and stay with the game plan, and have an all-around great baseball game was huge for us. “We get to go into an off-day and sleep on this win. That will bring motivation for the next series. You can ask anyone in this clubhouse, they wanted to go and beat the Brewers. We weren’t in here saying, ‘Let’s just go out and play baseball today.’ We played this game with a purpose, and there was a purpose today. I think that’s the mentality that we need every time. On June 11, the Phils are 33-30, three games behind the NL East Division-leading Washington Nationals (36-27) and Atlanta Braves (37-28). The Phillies didn’t win their 33rd game in 2017 until July 21. Despite their offensive struggles, they’re plus-12 in run differential. Two months into 2017, they were minus-58. Some areas, however, still need to be addressed. Eflin stopped the bleeding, momentarily, but this team was in freefall before they somehow managed to score four runs without the benefit of a hit (the team's RBI came from two groundballs, a walk and sacrifice fly) against Milwaukee on Sunday. The Phils are 2-7 over their last nine games, with Eflin earning both of the victories, lowering his ERA by nearly a run, going from 4.50 to 3.63, in that span. Jorge Alfaro says Sunday’s win was a good lift—especially with Monday as an off-day. Aaron Altherr stressed that no matter what outside the clubhouse might have thought after the first two games against Milwaukee, there was no frustration nor panic within it. “It was a rough couple of days, but we are the type of team that doesn’t dwell on the past too much,” Altherr said. “We gave up a lot of runs, but we always do a good job of coming back and not letting games like that get to us. We’ll go after the next game and get ready to play. “We still plenty of the season left and we’re still in a good spot and turn it around—and I think we will. The loss in Chicago [on the Jason Heyward walk-off grand slam on June 6] was definitely heartbreaking. It reminded me of last year when we were in LA and were up by three and lost.